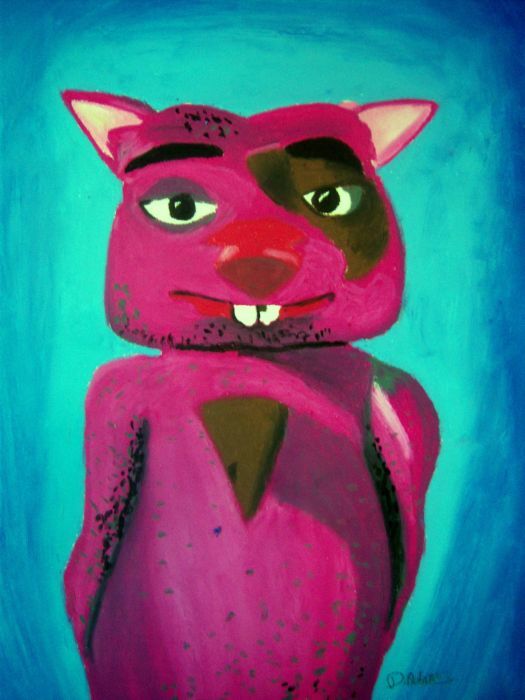 This is an oil pastel painting of Winky, a Wombie from the Wombania Comic Strip. Winky is Binky’s younger brother. I did do an oil pastel of Binky here a few weeks ago. I just couldn’t leave Winky out being that he is a close relative. I read the comic strip several times a week, which is updated Monday’s and Thursday, and try to keep up on the fun. You may enjoy it yourself here. Close to finishing I had developed some trouble with my wrist. I should have waited to finish, but I wanted to get him done today before a big week ahead. So he has a few rough spots in some areas. I can feel the love! Thanks, Debbie! Now I can say I’m just as important as Binky, having my official portrait done in oil. Yes, Winky, you are. But you know, you were already famous! I know you are bigger, and am so sorry I forgot to mention that in the post for you. But I’m sure the readers will learn that soon enough as they read up on you. I just had a pile of chocolate the night before last, so I can’t today. But I had peanut butter and jelly sandwiches. I always eat two, since one just makes me want more. Oh I know! I have to starve myself all day just so I can have two. I have to have two, the first one just is the appetizer . The wrist will be fine, just needs a little rest, and an aspirin. Thanks my friend, You have a ghoulish night now. If just a few little things here and there that I know I can fine tune. Not even sure anyone would even know the difference, but I would. And it turns out that Winky likes its. I had to get one done of him fast. He needed love, the poor little fella. He feels loved now. Andro, you’ll just have to read http://www.comics.wombania.com/2011/09/how-much-you-are-loved/ to see what I’m talking about. I haven’t seen you there. Andro, I thank you so much for that wickedly fine comment you gave me. It really made my day….evening would be better said. Have a wonderful spooky evening my dark friend. thanks for the intro to the characters and for the fun picture! You’d have more fun reading the comic twice a week. The painting is for his mantel. Thank you for coming in cursi and commenting! Oh boy, I’m wicked, too! Just like my big brother! I don’t usually call him that since I’m bigger than he is. Not that that is important, but just so you know, you know? So am I! I didn’t type that! Winky stole my identity! Mmmm… chocolates. That was so good I forgot what I came here to say. Oh, yeah. I didn’t steal Binky’s identity! He left the computer on and forgot to log out, and when I posted my last reply, I was him instead of me. But now I’m me again, not him. So everything’s good again. Especially those chocolates. Oh Winky, there you are! You were confusing me my little friend. But since it’s all better now and you are you, not him, you can have some of the chocolate fudge I have in my fridge…I got a bunch of it. Fudge!! I can never resist fudge! Fudge is almost too good to be true! It true, Winky, it’s true and here is some for you….. Thank you, Gary, and it just so happen that he really is warm and friendly too. I’m usually warm and friendly, unless some one tries to steal my chocolate. What happens if they do steal it, Winky? Probably not too much. Maybe some crying. No need to cry. Just bite there toes. I’m glad you like it. Winky did too! I have a few rough spots, too, so I wouldn’t really worry about them. It’s probably more realistic that way! I don’t think if actually make the pain go away, but it still make me feel better. Have some, but proceed with caution for it can reek havoc on the waist, thighs, and a few other spots. lol …..not so funny if it happens though. I use my right hand for the mouse and I draw with my left. I hurt the left one, but it feels much better now. What’s that called now…ambidextrous, but I’m not a real one. Just some things with left, whilst others with the right. Any chocolate will do; it’s all good. Thanks for commenting, Lady Pen! You have captured him well in this painting! Love the colors! He’s a bit brighter than I see him to be, but it was the best mix I came up with. I think the color makes him shine. I’m pretty bright! Well, at least some of the time! None the less, Winky. This is your new page to come and get chocolate whenever you don’t feel loved. All you have to do it say, “chocolate please.” and it will appear just for you. I just might never leave now! If you hear someone burrowing under your trailer, it’s just me making a new home. Okay, but remember we to go home in the Fall, but you’ll like it under the house much better where there is lots of places for you to sharpen your nails. Beats clippers. And remember, your chocolate a waits you on your very own page. Your home sounds better for the winter. I’ll be sure to follow, and be sure to come back here for my fill of chocolates (if there is such a thing). Oh yeah, much better. Lots of trees in our woods too for playing. Well, online there is such thing a virtual chocolate. Which isn’t bad, because I never run out of it. Very nicely done, Ms. A! A wonderful portrait of a great character (you always capture the best sparkle in your subject’s eyes)! I hope that your wrist is feeling much better, too! Ah, now that’s good to hear since to me the eyes makes the whole person, or the character. The eyes is what tell us who we are looking at. Do you have a nick name or something shorter I can call you? I’m fine with pretty much anything, Ms. A! lol you are too funny, Bob! about the four letter words. Have a nice Thursday Debbie. Thank you Sabina and so nice to have a visit from you. I’m rather fond of the Wombies and enjoy trying to capture the character in a painting. You agreed with Andro, Wow, thank you for the wonderful comment, Sabina!! Have a great day ahead Sabi. Thanks George, so glad to hear I pulled it of again. Winky looks great! I didn’t notice any rough spots. I hope your wrist is healing up. I get wrist pain from various activities as well. When you painted Binky is when I stumbled into here. Or maybe it was vice-versa. I can’t remember but I’m glad for the crossover so now I have both places to visit! Thanks Curtis. It’s just on the edges in a few place. But Winky likes it the way it is, so I’ll leave it be. Wrist is all better….old age I guess. When you first came to my blog is was when you viewed Binky. But all I care about is that you are here, and I get to enjoy you comic. great job Ms. Adams 🙂 I can’t find the rough spots…but then again,I am not an artist. Winky likes his portrait the way it is, so I’m not going to make any adjustments to his painting. Have a good night my good friend, and I will be over to your space later. Oh Winky, where are you? I’m making a batch of chocolate fudge today.